NDP Leader Jagmeet Singh is calling on the Liberal government to abandon its decision to side with the U.S. and Brazil over the crisis in Venezuela — hours after two NDP candidates and one MP came out with much stronger statements condemning Ottawa's move as failing to stand up for Venezuelans. 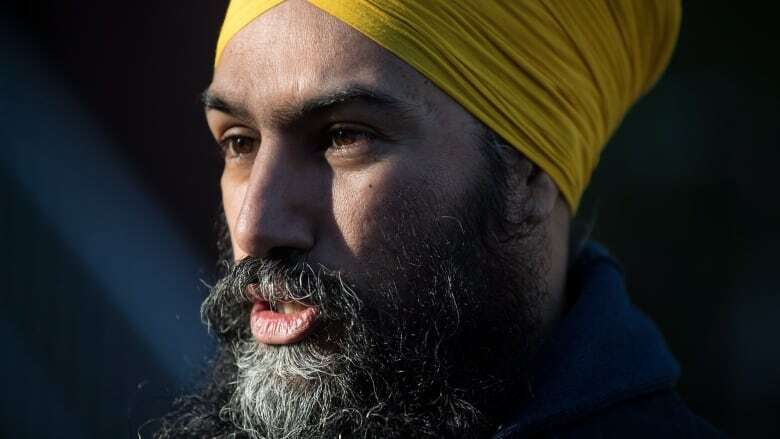 Singh issued the short statement outlining his position Thursday after NDP MP Niki Ashton and candidate Jessa McLean joined candidate Svend Robinson in attacking Prime Minister Justin Trudeau and his government for making common cause with the Trump administration and the right-wing government of Jair Bolsonaro in Brazil over Venezuela. "Canada should not simply follow the U.S.'s foreign policy, particularly given its history of self-interested interference in the region," Singh said in a statement. "The question of who is to lead Venezuela should be in the hands of Venezuelans. All countries should be free to make their own democratic decisions through free and fair elections, independent of authoritative pressure or foreign interference." An NDP official speaking on background told CBC News that the party condemns the actions of Venezuelan President Nicolas Maduro, calling him a thug, but would not cut ties with the leader and would continue to recognize his government. Venezuela is a major oil producer that has been wracked by hyperinflation, food shortages and rising violent crime since Maduro came to power in 2013. Maduro's government accuses the U.S. and others of launching an "economic war" against Venezuela, blaming foreign sanctions against his country for most of its problems. On Wednesday, Juan Guaido, the Venezuelan opposition leader and head of the National Assembly, swore himself in as interim president and was quickly recognized as such by Canada, the U.S. and other nations, including Argentina, Brazil, Chile and Colombia. Bolivia, Cuba, Turkey, Mexico and Russia, among others, have not followed suit and continue to back Maduro as the rightful president, accusing the U.S. and others of interfering in Venezuela's internal affairs. Guaido maintains that articles 233, 333 and 350 of the country's constitution allow him to assume interim power because, he said, Maduro's presidency is invalid. Article 333, for example states that the constitution of Venezuela does not become invalid if it ceases to be observed by an act of force or is repealed. Article 350 goes on to say that the people of Venezuela should ignore any regime, legislation or authority that contravenes democratic values, principles and guarantees, or undermines human rights. Guaido has called on officers in the army to defend the constitution but has stopped short of advocating military-induced regime change. "We're not asking you to stage a coup d'etat, we're not asking you to shoot. On the contrary, we're asking you not to shoot us, to defend together with us the rights of our people," Guaido said in a video message directed to the country's military. ​Late Wednesday, Singh published a broad statement on his Twitter feed saying Canada should work with "regional partners to provide support" for the humanitarian crisis unfolding in the country but stopped short of saying Canada should abandon its support for Guaido. Early Thursday, he issued a much stronger statement after Ashton tweeted that Bolsonaro was a "fascist" and Robinson told reporters that the Brazilian president was a "thug" despite having won the presidency in a democratic election. Ashton and Robinson also charged that Canada's decision to recognize Guaido as interim president is tantamount to supporting a military takeover of the Venezuelan government. "PM Trudeau sides with [U.S. President Donald] Trump's regime change agenda and Brazil's fascist President in support of someone calling for a military coup in Venezuela," Ashton said on Twitter. "No! We cannot support an agenda of economic or military coups. #HandsOffVenezuela." Robinson said it is hypocritical of the Trudeau government to advocate for democracy in Venezuela while failing to make the same call for countries such as Saudi Arabia. "It is shameful that the government of Canada, and Justin Trudeau, is lining up with Donald Trump, with the authoritarian thug [Jair] Bolsonaro, the president of Brazil, and is in-fact recognizing a coup, an illegal coup," he said. "This is not respecting the people of Venezuela." Their comments echoed remarks made by NDP candidate Jessa McLean, who suggested that the Liberals' move was undemocratic. Robinson said that Canada should abandon its current policy and seek a solution to the crisis through the international community. "Work with the United Nations and let's try to find a mechanism so that the voices of the people of Venezuela are heard," Robinson said. "Does that mean another election? It may be, it may be. But standing in support of an illegal coup is shameful and unacceptable." Ben Rowswell, Canada's former ambassador to Venezuela, told CBC News Network's Power & Politics on Thursday that backing Guaido and the National Assembly is standing with the only democratically elected institution left in the country while striking its own path. "Canada is not following what the United States is doing," he said. "The United States, irresponsibly, has said that they would be willing to consider all options to address the situation in Venezuela — including military, which is outrageous and wrong." Aside from its recognition of Guaido, Canada is taking steps to work with its allies to find a resolution to the Venezuelan crisis. In February or March Canada will host a meeting of the Lima group of countries to discuss the issue. The group was formed in the summer of 2017 and includes Argentina, Brazil, Canada, Chile, Colombia, Costa Rica, Guatemala, Honduras, Mexico, Panama, Paraguay, Peru, Guyana and Saint Lucia. Rowswell noted that the U.S. is not a part of the Lima group and has been on the sidelines while Canada as been working with Peru, Colombia, Brazil, Argentina and Chile to resolve the Venezuela problem. "The United States is not even at the table, but because president Trump tends to get a lot of press as soon as he opens up his mouth, all of a sudden it becomes a U.S. story," he said.